You have a product or service people want, and you feel it’s time to grow. Franchising can help you expand into additional locations in other markets without being responsible for investing all of the necessary capital yourself. 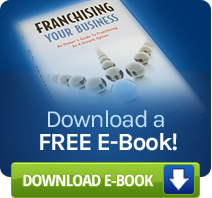 Franchising opens doors of opportunity for both you and your business, if you are franchisable. To properly franchise, you must first determine if raising capital through franchising your business is right for you, or if other growth options would better suit you. How do you franchise, and what effects will rapid expansion have on your current staff? How long will it take? This is where Francorp can make a difference. Our exclusive method is a proven system which will help you control the cost of franchising, plus our development services can help you sell your franchise. We know how to franchise from an idea, or an existing business. Take this quiz to find out if you have what it takes to be franchisable. Then, while you continue to build your brand, use this checklist to make sure you don’t miss any steps. Francorp has a long list of companies who have benefited from our franchise development and consulting services. We have many different pricing and payment options to suit your needs. Contact us to speak with one of our Franchise Analysts, and let us determine how we can best help you start your own success story. If you would rather meet our team in person, you can tour the Francorp Headquarters or meet with a Senior Consultant at an upcoming event.